Someone broke into Vittles food truck and damaged the vehicle, breaking the awning, spilling chemicals, and leaving grills lit. WILMINGTON, NC (WECT) - A popular Wilmington food truck was vandalized, and police investigators are trying to catch the criminal. On Thursday morning, a Vittles food truck employee discovered exterior and interior damage to the company’s vehicle parked in its commissary on Oleander Drive. A food truck commissary is its home base, where the vehicle is stocked, cleaned, and maintained. Champion discussed the food truck’s vandalism and asked for the public’s help identifying any suspects in a Facebook video, which has been viewed more than 11,000 times as of this story’s publication. Please spread the word. Help us catch whoever did this! Champion said the vandal or vandals broke in, damaged the vehicle, spilled chemicals, and left the grill’s fire lit. Crime scene investigators collected evidence of the damage. 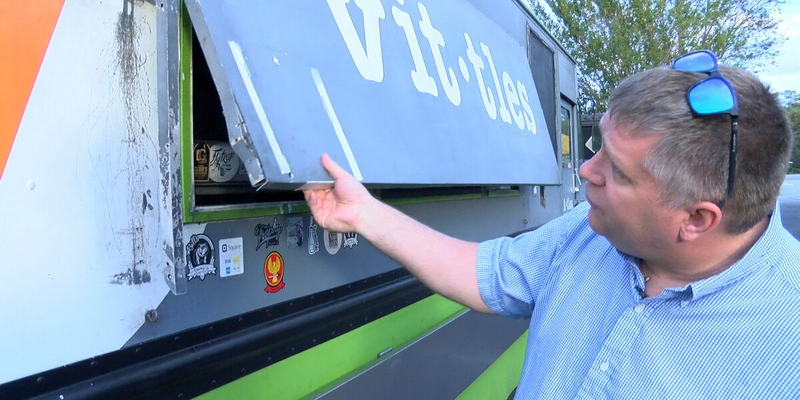 Vittles food truck — voted a WECT Fan Favorite — was forced to cancel events on Thursday and Friday, including a fall festival at Champion’s daughter’s school. Vittles employees worked all day Thursday to clean the truck and restore it. They plan to be at their regularly scheduled events on Saturday. Champion and his team stepped up during and immediately after Hurricane Florence to serve hot meals to people. They participate in fundraisers, schools events, and other community outreach. “This is one of the businesses I purchased to give back to the community,” said Champion. WECT reached out the Wilmington Police Department to learn about the status of the investigation. Champion said he believes the vandalism amounts to several felonies, but acknowledged the damage could have been worse.